I wish to reuse some of the output in another LATEX document. How can I do that? The Wikipublisher system is configured by default to process content all the way to a printable PDF. However, readers can control this to generate and save various intermediate outputs, using options on the standard Download form. Pressing the View XML button will cause PmWiki to return the Wikibook XML source code to the Web browser. A reader can save this as a text file, then open and edit it in any XML editor. The XML will conform to the Wikibook DTD. If you just want to copy and paste a few fragments of LATEX into another document, press the debug button. This will cause the Wikibook PDF server to echo the XML and then the `LATEX code back to the browser, without returning a PDF. If the administrator has set $EnableLatex = true; in the local/config.php file, the download page will include a LATEX button, as well as the debug option. Pressing this instructs the PDF server to deliver a gzipped bundle including the LATEX source, any subsidiary LATEX source files (e.g. for long tables), and a full set of images. The XSL instructions for transforming Wikibook XML into LATEX do not format the generated LATEX for human readability. On the other hand, neither do many human writers. It can also be a bit verbose; where a human writer would perhaps define a new command in the preamble, the XSL generally writes out the relevant LATEX in full every time. 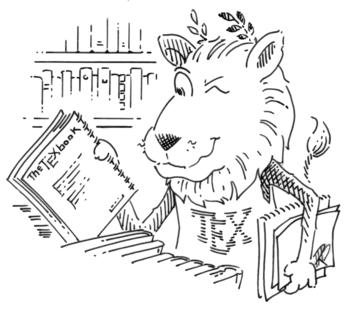 The CTAN lion drawing is by Duane Bibby; thanks to www.ctan.org, it is freely available for public use.